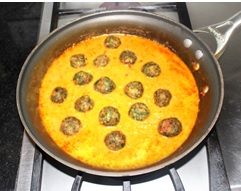 Palak kofta (spinach kofta) is a delicious vegetarian main course dish. ﻿These ﻿spinach koftas balls are made with chopped spinach and mixed with besan (gram flour) chopped onion, minced garlic, green chilies and some spices are added to make them delicious, then they are deep fried like pakoras and later simmered in spicy gravy. Spinach is very nutritious but kids run away from it but they will love palak koftas. When you get tired of eating usual regular food and you want to make something special and give a little variation to dinner menu koftas always come in mind. 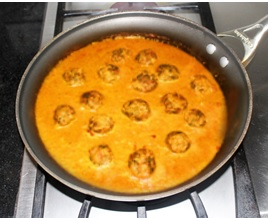 There are so many different kinds of koftas and cooking recipes all over India and lot of variations could be made in kofta ingredients so try it and make variation each time. 1. Thaw the frozen spinach and boil the fresh or frozen chopped spinach. Boiled spinach contain lot of water, squeeze all the water out. powder and Besan (Garam flour) salt. oil is hot enough, turn the heat down. 6. Now gently drop 7 to 8 balls in the hot oil, do not touch the balls, let them fry for 1 minute then with the spatula turn them around, and let the other side fry for 1 minute, then flip. Keep flipping the balls around for 8 to 10 minutes on low heat so that inside of the balls get cooked. 9. Drop another batch of koftas balls then raise the heat a little and let them fry. Repeat the process until all the balls are fried. 3. 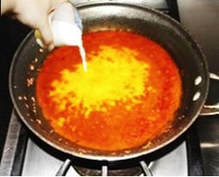 While onion mixture cooks add the tomato to the same food chopper or blender and puree. onions fry for 8 to 9 minutes, frequently stir the onions. 5. 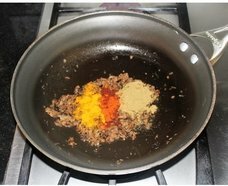 Once the onions become light brown add coriander powder, red chili powder, turmeric powder and mix with the fried onion and fry for few seconds. mix and let it cook. 10. Once half of the water evaporated form the gravy add ½ cup of milk and mix it well with the gravy and stir constantly for 1 minute so that milk blend in well with the gravy. Let the gravy cook for 8 to 10 minutes, while frequently stirring the gravy. Milk binds the gravy with onion masala. 11. Once onions and milk blend in together, and gravy taste right add little water and bring to boil, because koftas will soak lot of water, add fried spinach koftas in the gravy and mix, coat all the koftas with gravy and simmer for 2 minutes, turn the heat off. 12. Once koftas are soaked and gravy become thicker, add more water to the desired consistency, give a boil and turn the stove off. it out from recipe, the dish will still taste delicious.